From our reviews, Here are the top rated and best 12" MacBook USB Type-C Hubs with difference choices of shapes, ports and other features you can buy in 2016. We have been lucky to find the best MacBook USB Type-C Hub that is small, portable and more connectivity options. The new release 12″ MacBook computer is a big hardware change among all history of Macintosh computers. The MacBook has been promoted by Apple as “Light. Years ahead”. With the latest innovation of USB Type-C standard, Apple has decided to use only a single USB Type-C port on its new MacBook. A computer with an only single port will definitely make you into trouble when you getting into your work. You will face the problems when you want to connect multiple devices at the same time. Using USB Type-C Hubs specifically for your 12″ MacBook is a great idea. You will enjoy an additional number of USB ports and other connectivity options. For your convenient, we have listed down the best USB Type-C Hubs with difference choices of shapes, ports, and other features as below. 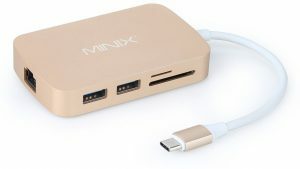 The Minix Neo C multiple ports are the most advanced USB Type-C hub that integrated all connectivity options you ever need. This adapter will bring all connectivity options you found on the most laptop to your Macbook computer. This adapter has a VGA output port for adding another display to your MacBook. It has a Gigabit ethernet port for connecting to your corporate network. Furthermore, it also has SD Reader, 2 x USB 3.0 ports and a USB Type-C port for charging your MacBook simultaneously . If you want a USB hub that fit well with your MacBook then this HooToo Shuttle 3.1 USB Type-C Hub will be your obvious choice. This device made from the high-quality unibody aluminum alloy exterior. This device has a USB Type-C port for charging your MacBook simultaneously. It has 1 x SDXC card reader and 3 x USB 3.0 ports with high-speed 5.0 Gbps. In addition, one of the USB ports can be for charging your smartphones with 0.5A max. This Anker Premium USB-C Hub has all required expansion ports you needed in a compact aluminum design. With 2 x USB 3.0 ports with super-speed up to 5 Gbps allow you to connect to your favorite devices. This device has a USB C port for charging your MacBook and USB devices simultaneously. It also features a Gigabit ethernet port for connecting to your corporate network. This is an another option for whom that need to access more memory cards at the same time. 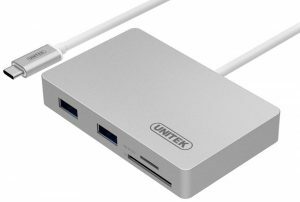 This UNITEK USB Type-C Hub features a MicroSD and an SD card reader for accessing or storing data into any size of the SD memory card. This device has a USB C port for charging your MacBook (at the rear of the device) and USB devices simultaneously. It also has 2 x USB 3.0 ports with super-speed up to 5 Gbps allow you to connect to your favorite devices. 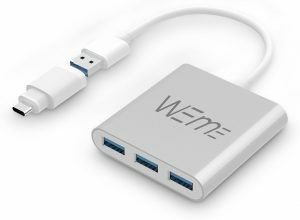 If you want a simple, cheaper and flexible USB Type-C hub then this WEme USB C hub is a right choice. 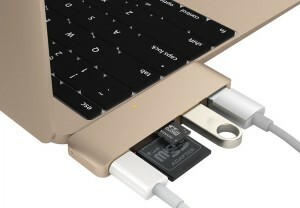 You can switch between USB Type-A and Type-C with an included connector. It works well with your MacBook with a strong 1ft cable. 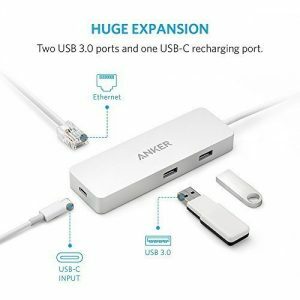 This USB hub has 4 x USB 3.0 ports (3 ports in the front and 1 and the rear) for connecting to your favorite devices. Moreover, this device also included a single microUSB port for connecting external power source when you want to connect to high-powered devices. 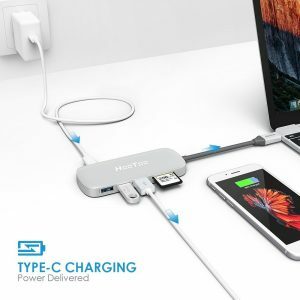 If you want a USB hub that fit very well with your MacBook then this HyperDrive MacBook USB Type-C Hub will be your obvious choice. This device is designed specifically for the new 12″ MacBook while also works with other USB-Type C devices. This hub made from aluminum and available in 3 colors for matching every MacBook colors including gold, space gray, and silver. This device has 1 x SDXC, 1 x MicroSDXC reader and 2 x USB 3.0. Finally, it has a USB Type-C for charging and connecting to 4K video. Those are the best MacBook USB Type-C hubs that all of them are work and look great when you using it with your 12″ MacBook. The great choice for you is depending on your budget, the number of port requirement and additional features such as SD card reader, VGA output, and wired network connection.